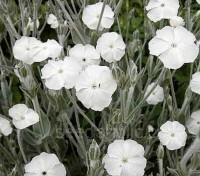 With silvery-grey felted leaves and lax sprays of long-stalked, vivid rose-purple flowers in late summer, Rose Campion flowers with a big showy display that maintains interest at a time when many other plants are flagging. A very useful plant in the garden. 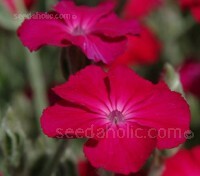 Lychnis can be grown as a border plant or as part of a mixed perennial display. It that maintains interest in the border at a time when many other plants are flagging. Rosettes of soft silver-grey woolly foliage make it a very useful plant in the garden. 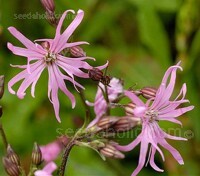 Ragged robin is found growing naturally in damp meadows and woods in Europe, It has the typical, flat flower-heads of Lychnis, but these are loose, with only a few individual flowers. They may vary from purplish pink to white and are star-shaped, with deeply cut petals. 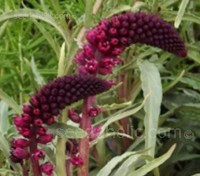 Recently introduced to gardens and a hit Chelsea Flower Show, Lysimachia ‘Beaujolais’ feature flower spikes of deep claret which bloom continuously from May to September. The plants give a good effect used in tight drifts through grasses and other perennials. Ideal for cutting, the dark flowers are adorable in bunches. Magnificent and spectacular spikes of rose-purple flowers, which last from June throughout the summer distinguish this tall wetland plant. 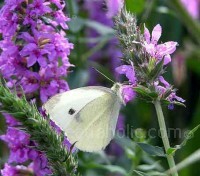 Purple loosestrife is an easy garden plant, thriving in any soil. It is a beautiful subject for late summer colour in a border, shrubbery, large pond or slow-moving water.